LEF1 antibody recognizes the lymphoid enhancer-binding factor 1, also known as T cell-specific transcription factor 1-alpha, or TCF1-alpha. Mouse anti Human LEF1 antibody recognizes the lymphoid enhancer-binding factor 1, also known as T cell-specific transcription factor 1-alpha and TCF1-alpha. LEF1 encodes a transcription factor belonging to a family of proteins that share homology with the high mobility group protein-1. The protein encoded by LEF1 can bind to a functionally important site in the T-cell receptor-alpha enhancer, thereby conferring maximal enhancer activity. This transcription factor is involved in the Wnt signaling pathway, and it may function in hair cell differentiation and follicle morphogenesis. Mutations in LEF1 have been found in somatic sebaceous tumors. LEF1 has also been linked to other cancers, including androgen-independent prostate cancer. Alternative splicing results in multiple transcript variants (provided by RefSeq, Oct 2009). 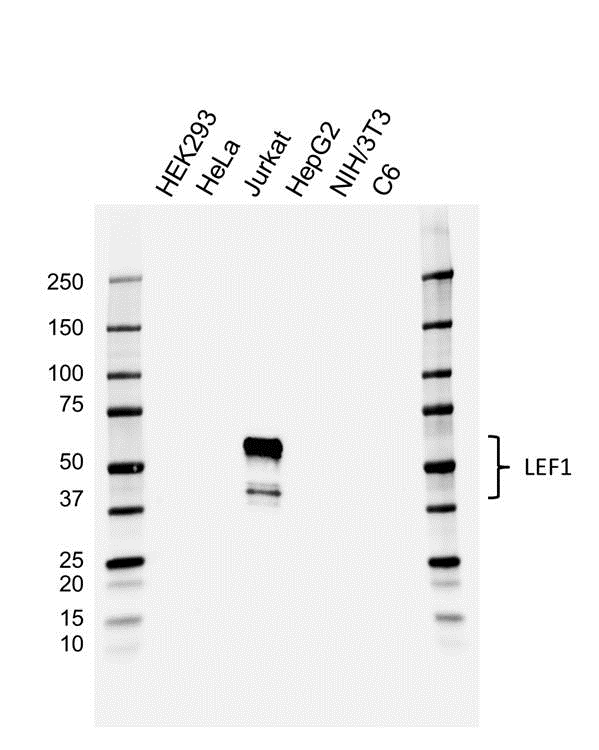 Mouse anti Human LEF1 antibody detects bands of 39, 42 and 58 kDa. The antibody has been extensively validated for western blotting using whole cell lysates.